RCS is coming soon, and it’s set to transform your customer communications. Here are five ways you can use RCS in your customer engagement strategy. Imagine making your way to the airport, safe in the knowledge that your boarding pass and current gate information are all in one message on your mobile phone. An hour later, while sitting in the departure lounge bar, you receive a notification that your first flight is delayed and you’ll miss your connecting flight. But there’s no drama. Your notification lets you confirm a new booking with a partner carrier, and contains your new boarding pass and a map to where you need to go. And while you’re waiting, you check out the on-board menu — available with a button press — to decide whether you’ll eat something in terminal or mid-flight. When you eventually settle in your window seat, you’re actually a little impressed with how smoothly the airline dealt with the delay. And when the customer survey comes through post flight — right under the notification — you still rank them a 5/5. That smooth experience was enabled by Rich Communication Services (RCS) — a technology that’s about to change your customer engagement for the better. You need to give your customers the information they need, right when they need, via a channel they use and trust. At OpenMarket, we call that an “empathetic interaction”. To date, we’ve mostly talked about delivering those interactions via SMS. Now, RCS is set to take it to the next level — with rich, interactive, app-like messages delivered straight to a smartphone inbox. RCS will go mainstream soon, but some companies (including OpenMarket) are already testing new RCS-based services with major brands. 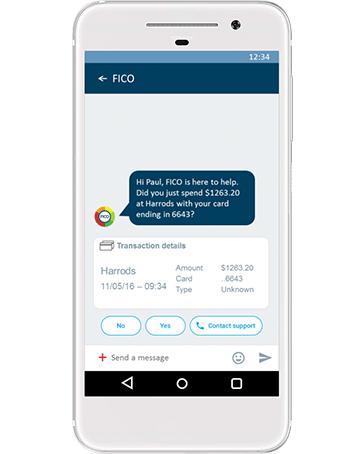 Here are five ways we think RCS could revolutionize your communications — helping you build a loyal, vocal fan base of customers. Put yourself in your customer’s shoes for a moment. You’re waiting for an Internet delivery, or perhaps you’ve booked a doctor’s appointment. In these situations it’s more than useful to receive a confirmation or reminder by SMS. It’s even better if there’s an option to “Text 1” to cancel the appointment or “Text 2” to change the time of the appointment. But with RCS, organizations can offer customers even richer and more interactive experiences. Pre-set option buttons, for instance, with a choice of appointment times or delivery slots enable customers to easily select a time that works best for them. The service you offer becomes that much more empathetic and personal. 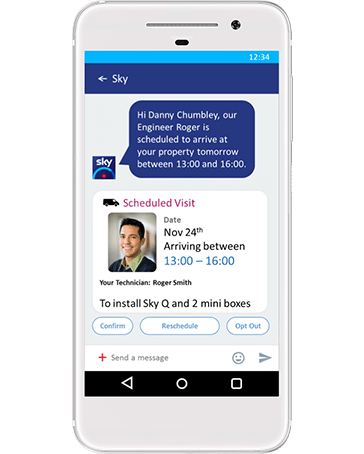 In this example, RCS makes it easier than ever for customers to book and rebook appointments and deliveries. No one likes stuff breaking down. And the more indispensable the piece of kit, the greater the impact. In a busy hospital, for example, if an MRI scanner unexpectedly starts to overheat, it can affect patients, staff schedules and hospital operations. Before the Internet of Things (IoT), customers were only alerted to a breakdown after it happened. But with connected devices and RCS, you can anticipate problems with your products, and alert someone with an information-rich SMS before anything bad happens. Because it’s RCS, the message can include all kinds of useful information that a traditional SMS couldn’t – like a map showing the exact location of the equipment, a link through to its previous service history, and a graph showing its current and recent temperature levels. For customers, access to their bank account is something they take for granted. If they can’t access their account because of suspected fraud – because they’re abroad or have bought something unusual – it can ruin their day. Now, a bank can use RCS to message a customer to alert them to a possible fraudulent transaction, along with an image of the transaction details. Pre-set options mean the customer can confirm the transaction is genuine (or not) with just one tap, or tap a button to contact the bank’s support team with any questions. With 98 percent of texts being opened and 90 percent read within three minutes, there’s a very good chance the customer will respond right away. The bank doesn’t have to put a stop on their account, and the customer continues about their day with no disruption — avoiding the usual painful phone calls to get their account unblocked. In this example of an empathetic interaction in banking, a timely RCS message can save the customer an unpleasant experience getting their account unblocked. It’s an empathetic interaction made richer with RCS – creating an easy and seamless experience for the customer, while helping to protect the bank against fraud. We all rely on critical infrastructure like roads, utilities, street lighting and public transport to get us through the day. It’s something we take for granted — but when it goes wrong, it can be hugely disruptive. Now, connected infrastructure is helping to minimise disruption and safety risks by continuously monitoring and reporting on its status. And that’s set to go one step further with RCS. Imagine a truck backs into a lamp post in the early hours, causing it to dangle over the road. When rush hour starts, it could cause serious disruption to traffic — not to mention creating a possible safety hazard. Now imagine the lamp post is connected to the IoT and an RCS platform. The impact triggers an immediate, information-rich SMS to the maintenance crew, stating what the problem is, its exact position on a map, and what solution it requires. The problem can be fixed before it creates havoc. Sometimes, even the best-intentioned customer communications can irritate rather than delight. A barrage of separate confirmation texts, email receipts and app notifications can create frustration and confusion. How great would it be to give your customers all the information they need in one place, with no need for an app — and in a channel they like, use and trust — including the option to respond in real time? That’s what’s possible with RCS. No more misplaced bookings, and no more costly apps to develop. The result: satisfied customers who, because of the hassle you’ve saved them, will stay loyal to your brand and tell other people about their experience. RCS is ready to take off. And with backing from major players in mobile telecoms, it will soon be available to everyone. To find out more about RCS, who’s using it, and how you can start exploring its potential, get our RCS datasheet or watch our RCS webinar. And if you’d like to talk to someone about joining the OpenMarket RCS Early Adopters Program (REAP), get in touch now. We’re really excited to help you make the most of the opportunity.